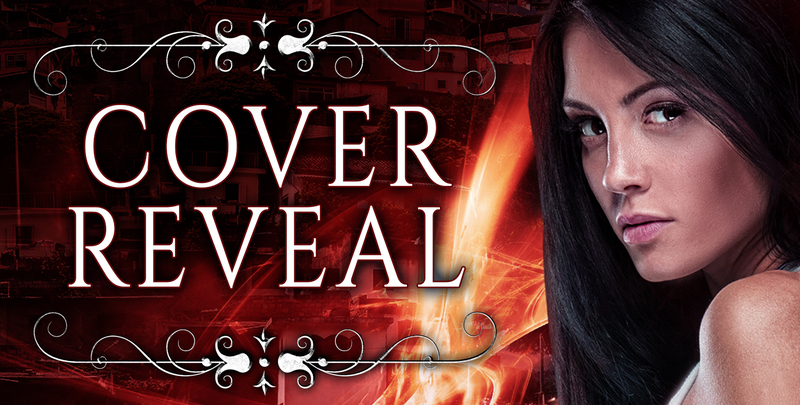 Literary Braun: Sunday Snippet: "My heart couldn’t take much more of this" ... And DAMNATION'S DOOR cover reveal! Sunday Snippet: "My heart couldn’t take much more of this" ... And DAMNATION'S DOOR cover reveal! The Stormkind towered over me like some ancient ocean god, its glowing white eyes searing my own retinas. Water cascaded around its featureless body, making the beacons of light in its skeleton shiver. A flash of light seared my vision. It concealed a dark shape that crashed into the ground inches from my feet. I shrieked and scuttled back. My heart couldn’t take much more of this. If I didn’t pass out, I might become one of the only eighteen year olds to die of a heart attack. The light between me and the Stormkind faded. In its place stood a man. Who is the crazy guy standing in the middle of a hurricane? Why is he facing down a weather-controlling alien? Is he a friend... or a foe? 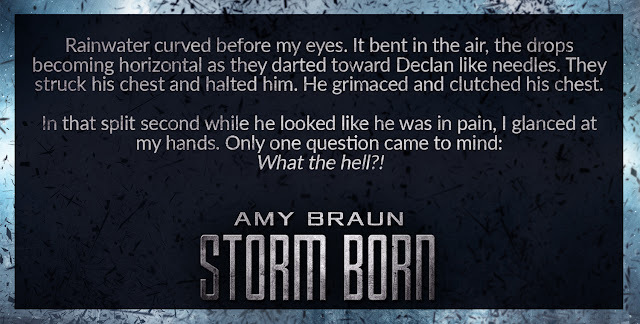 Well, I know, but you'll just have to tune in next week for more teasers, or better yet, pre-order your copy of Storm Born from the links below! 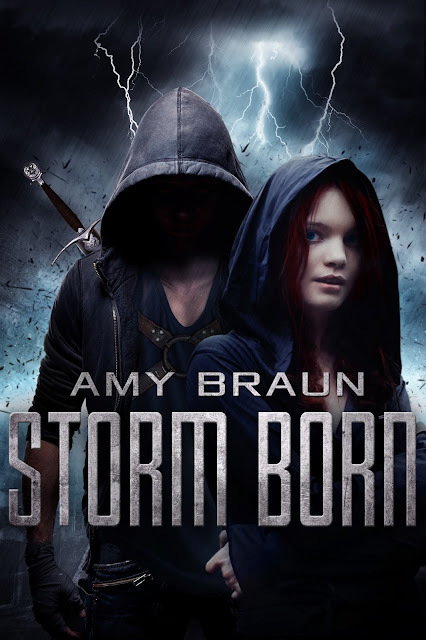 While I'm excited and eager to release Storm Born, that's not the only novel I'm getting ready to promote. You might have heard me gushing about a new cover for another new novel that I've been working for. One that is close to my heart and part of my soul, and already has two books to its name. 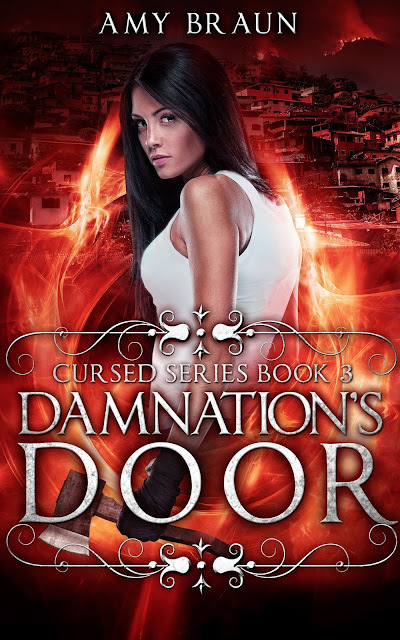 Yes, ladies and gents, it's time to reveal the cover and synopsis for Damnation's Door, the third and final Cursed novel! Major, major, major thanks to XPresso Book Tours, Kim from DDD, and all the bloggers who signed up. You guys have no idea how happy this has made me, and how much learning I've taken away from it. Now is also the time to pre-orders Damnation's Door at any of these online stores! The print copies should be in next week, along with the rest of my swag. I'm planning lots of giveaways for both books, so be on the lookout for them. I'm still getting used to the idea of owning an entire trilogy of my own. It's pretty damn awesome. This was a very long post, but I couldn't help myself. Before you go, remember to check out the other Weekend Writing Warriors blogs and leave them some love in the comments. I'm not the only one with release dates coming up! Terrifying, and is the dark shape friend or foe? That last sentence packed a punch after the description you wrote. Well done! Wow. Very visual excerpt, Amy. Suspenseful and certainly got my heart to pounding. Wow, scary as all heck! Sure am glad I didn't miss this excerpt! Oooo, loved the snippet, so dramatic and tense! Excellent snippet Amy! I could taste the salty water! Great descriptions, and enjoying these series of snippets I've seen. Will have to remember to add your works to my to-read lists. Wow! Vivid and gripping - and the sudden appearance of the man at the end of the snippet raises all sorts of questions! Good snippet - I like it. I think this dude just saved her from the Stormkind, right? Even if I'm wrong, he sure knows how to make an entrance! I think that the first person perspective can work well in this brand of fiction.